Is the BBC really impartial? Interview with scholar of the BBC, Tom Mills, on his new book. 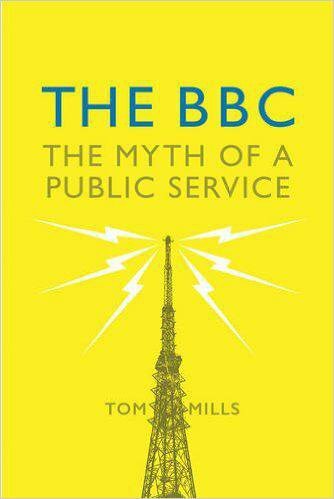 Tom Mills, a Lecturer in Sociology and Policy at Aston University and former Co-Editor of New Left Project, has just published his first book, The BBC: Myth of a Public Service. Using archival research, original interviews, autobiographies and secondary sources Mills examines the politics of the BBC, arguably the most influential and trusted news organisation in the UK. I asked Mills about the popular image of the BBC as independent and impartial, its Iraq War coverage and what changes he would like to see made at the Corporation. Ian Sinclair: In an interview with the Press Gazette after she was recently named Journalist of the Year at the British Journalism Awards, Laura Kuenssberg, the BBC’s Political Editor, said ‘Among the many jewels and gifts that the BBC has is our editorial independence’. She went on to argue ‘I would die in a ditch for the impartiality of the BBC. That’s what we do.’ Is the BBC independent and impartial? Tom Mills: The simple answer is ‘no’. But the question isn’t quite as straightforward as it sounds. First it is important to state from the outset what is rarely acknowledged in discussions about the BBC: that it isn’t independent from governments, let alone from the broader Establishment. The BBC has always been formally accountable to ministers for its operations. Governments set the terms under which it operates, they appoint its most senior figures, who in future will be directly involved in day-to-day managerial decision making, and they set the level of the licence fee, which is the BBC’s major source of income. So that’s the context within which the BBC operates, and it hardly amounts to independence in any substantive sense. But though politicians have never ceded overall control, they have generally granted the BBC editorial autonomy, at least for the most part. In the interwar period, the system of broadcasting pioneered by the BBC was referred to as ‘remote state control’. It emerged from a situation where politicians did not want a chaotic system of broadcasting to develop, especially given the presumed political power of the new medium. But equally, officials did not want to assume responsibility for producing broadcasting content, which is what the radio companies wanted – they basically had radios to sell but no broadcasting service for potential customers to listen to! So what emerged from this was the BBC, a broadcaster with an ambiguous kind of independence that in some cases has enjoyed substantive freedom, but which has always been kept under some degree of political control, and often enormous political pressure. Does this mean it’s independent? Well really the BBC’s not so different to various state institutions that are afforded operational autonomy but ultimately answerable to ministers or to parliament through various mechanisms, such as the police or the Bank of England. Getting back to Laura Kuenssberg, she spoke specifically about ‘editorial independence’, so I presume what she has in mind here is government interference in editorial decision making. Well that’s not exactly how this works. What happens is the editorial policy is defined at the top of the BBC – which is the most politicised section of the Corporation given that senior executives have to periodically negotiate with governments over its funding, its Charter and so on, and senior editorial figures have to respond to constant complaints over its reporting – and that policy then cascades down the hierarchy, in rather complex and uneven ways. You occasionally see glimpses of this at work, such as in 2010 when the then Director General Mark Thompson attended Downing Street to discuss the BBC’s reporting of the Coalition Government’s austerity agenda, and you get a much fuller picture of how this works in practice from archival sources and autobiographies, which I draw in the book. None of the actual evidence is suggestive of the kind of independence and impartiality that Kuenssberg praises to the skies. But her remarks reflect the fact that, rightly or wrongly, she has personally come to symbolise the BBC’s very conspicuous failures in exactly this regard. So naturally it’s in her interests to make these kinds of statements. But strongly asserting something doesn’t make it true, and it’s not. IS: A key issue seems to be the BBC’s working definition of impartiality. How would you define this? TM: I think the most straightforward way of putting this is that the BBC will aim to fairly and accurately reflect the balance of opinion amongst elites. In that respect it’s not so different to other reputable media organisations. But a number of studies suggest the range of opinion on the BBC is narrower than some of its rivals. Channel 4 News tends, I think, to have a broader range of perspectives, and the recent Media Reform Coalition’s report on the coverage of Corbyn found that the BBC gave much more airtime to Corbyn’s opponents than ITV. IS: As you note in your book, ‘The Gilligan Affair’ – when a critical April 2003 radio report by BBC Today Programme journalist Andrew Gilligan about the government’s claims about Iraqi WMDs kicked off a high-level conflict between the Labour government and the BBC – is often cited as evidence of the BBC’s independence. For example, the BBC’s official historian Professor Jean Seaton views it as an instance of the ‘determination of broadcasters not to be controlled.’ What do you think ‘The Gilligan Affair’ tells us about the relationship between the BBC and government? TM: The Iraq War was another area where scholarly research found that the BBC was more favourable to the government and its supporters, compared with other broadcasters, and that’s one of the very important factors that tends to get lost in the conventional take on this affair, which is actually very misleading. On the one hand, the report itself is evidence of independent reporting vis-à-vis the government, and that’s a good thing. But on the other hand, the reason the Today Programme felt confident broadcasting the report was that it was being briefed by MI6 and other sources, and so knew that sections of the British state were anxious about the case for war and what the possible fallout might be if and when no Weapons of Mass Destruction were found. So the ‘determination’ of the BBC in this case is based on the support of some of the most powerful and authoritative sources in the British state, and of course there was an enormous public mobilisation around this time as well. When the Blair government then attacks the BBC, it’s true that the BBC leadership stands firm, and that’s certainly commendable. But what then ultimately happens is that the chair and director general are both forced to resign, and the BBC publicly apologises to the government – a government that let’s not forget had launched an illegal war on a plainly false pretext. The former BBC governor, Kenneth Bloomfield, argues that ironically part of the reason the BBC leadership stood firm after the Gilligan report is precisely because it was personally so close to the Blair government. The then BBC chair, Gavyn Davies, a former Goldman Sachs partner, was not only close friends with Blair and [then Chancellor Gordon] Brown, his wife worked for Brown and his children were reportedly bridesmaid and pageboy at his wedding. So I think the ‘The Gilligan Affair’ is best understood as a rather bitter conflict within the British elite during a period of considerable crisis, and the lessons in terms of how we understand the BBC are much more complex than is generally recognised. IS: The arrival of John Birt as Deputy Director-General in 1987 seems to have heralded a significant change at the BBC? TM: Yes, that was the year when the then Director General Alasdair Milne, father of Guardian journalist and Corbyn advisor Seumas Milne, was forced to resign by the Thatcher appointed chair Marmaduke Hussey. Milne wasn’t a leftist by any means, but he had represented the more independent spirit of BBC programme making at that time. He was replaced by a BBC accountant called Michael Checkland and John Birt was meanwhile brought in from an ITV company to head the BBC’s journalism, later succeeding Checkland as Director General. Birt wasn’t really understood by his critics at the time, who seem to have been rather puzzled by his authoritarianism and his belligerent managerialism. They seem to have regarded him as a Stalinist, or something like that. But in fact he was an out-and-out neoliberal who wanted not only to introduce stronger editorial controls over BBC journalism, but also to radically shift its institutional structure and culture away from its ‘statist’ character and in a more neoliberal, business-friendly direction. This was resented by BBC staff and the Corporation went through a quite unhappy period, with a brief respite under Greg Dyke. As I describe in some detail in the book, Birt’s ‘reforms’ were part of a broader process of neoliberal restructuring, and in some ways Dyke was also part of that, especially in terms of the extent to which business reporting was pushed up the agenda during his time as director general. IS: Why are the politics and quality of the BBC’s news output important? TM: The BBC is the most popular single source of news for the British public, and is much more trusted than the press, for example. How it reports particular issues has a material effect on the political process, which in turn has consequences for everyone. In many cases – such as reporting on foreign policy, health or welfare issues – this is literally a matter of life or death. IS: What changes would you like the BBC to institute moving forward? TM: There’s not really space to do this question justice here, but very briefly I think first of all that all the various mechanisms of political control need to be eliminated altogether and replaced with forms of independent, or better still democratic, processes. That would be a big step in the right direction. But really I think we need to be thinking much more ambitiously about institutional design in the same way as Birt and the other neoliberals did in the 1980s and ‘90s. What kind of BBC do we want for the 21st century? That’s the real question we should be asking. It’s very clear that the BBC leadership are unable or unwilling to advance anything like an ambitious vision for public media. If they have a vision it is for the BBC to be retained as a source of public funding, quasi-official news, and a leading British brand that can give UK media companies an edge in the international market. They simply have no notion of the severity of the social crisis we are currently in and the political importance of public media and the values it should embody. If we want public media to survive, we are going to have to come up with a vision for the future. The BBC, or at least the people at the top of the BBC, will not do that for us.